SpeakCup is a simple tangible interface that uses shape change to convey meaning in its interaction design. 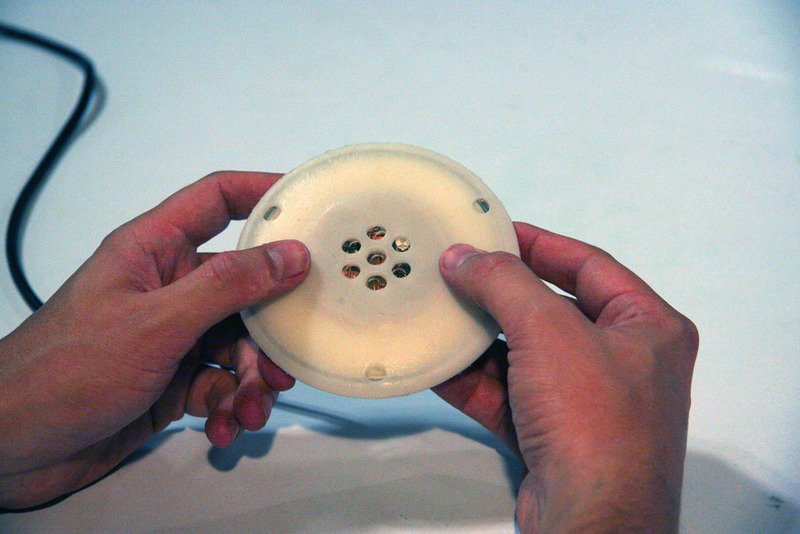 It's a voice recorder in the form of a soft silicone disk with embedded sensors and actuators. Advances in sensor technology and material science have provided new ways for users to interact with computational devices. Rather than issuing commands to a system via abstract and multi-purpose buttons, the door is open for more nuanced and application-specific approaches. In this project we explore the coupling of shape and action in an interface designed for simplicity. Coelho, M., and Zigelbaum, J. Shape-changing interfaces. Personal Ubiquitous Comput. 15, 2 (February 2011), 161-173. Zigelbaum, J., Labrune, J.B. Some Challenges for Designers of Shape Changing Interfaces. CHI 2009Workshop on Transitive Materials (2009). Zigelbaum, J., Chang, A., Gouldstone, J., Jen Monzen, J., and Ishii, H. SpeakCup: Simplicity, BABL, and Shape Change. Proc. TEI ‘08, ACM Press (2008), 145–146. Chang, A., Gouldstone, J., Zigelbaum, J., and Ishii, H. Simplicity in interaction design. Proc. TEI ‘07, ACM Press (2007), 135–138.